Mobile broadband cards and USB sticks are incredibly useful because they allow you to have a powerful wireless Internet connection with your mobile device, but sometimes you just want to connect your mobile broadband device to your wireless Internet router. This is a very powerful combination that can boost your router’s power. While there are many routers that have a slot for your broadband card, these routers typically cost about $200 more just for this feature. If you want to save your money and still connect to your router, then just follow these instructions. You need to make sure that everything is in working order before you connect your broadband card to the router. The first thing you need to do is check your mobile device or laptop. Ensure that the Internet connection is active and working. Just open the Internet browser and load a random website to make sure that it is working. The next thing that you need to do is sign into your computer with the administrator account. You will need to use the administrator account because you will be changing some of your computer’s settings. In Windows Seven it will be called “internet options” in the control panel, then network connections. You will see a menu with several different Internet connection types. Click the type of connection that you have. Wireless Internet is the most common connection. Right-click the section and select, “Properties.” See the screenshot below. There will be several tabs across the top of the screen. Click on the “Advanced” tab to enter the Internet Properties window. You will see a section called, “Internet Connection Sharing.” There should be many settings and boxes here, but you only need to pay attention to one area. 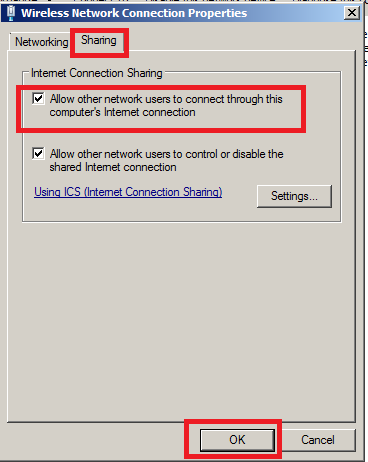 Click the “Allow” button to enable Internet sharing. This will allow you to connect the mobile broadband card to your wireless router. 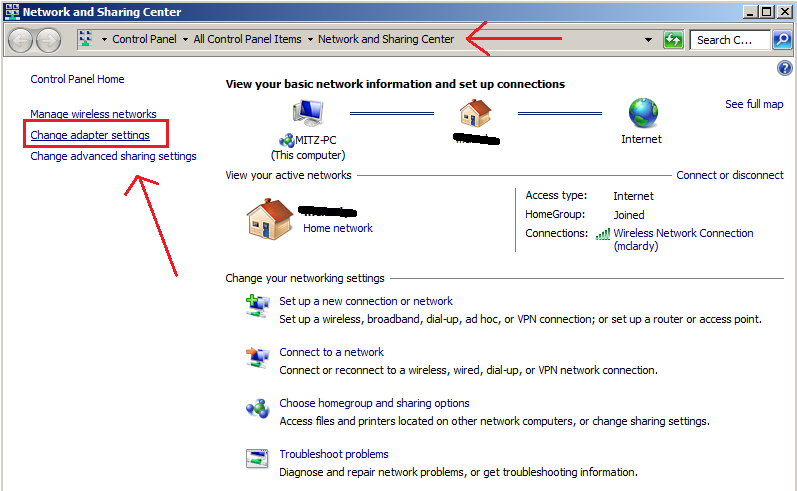 In Windows seven you need to go to the “Network and sharing center” to change these settings. Simply Press on “change adapter settings” on the left. As shown below. Then can go to the “sharing tab” to allow the connection. If you are using a dial-up connection and not a wireless one, then this part will be a little different. Click the “Establish” button so that the router can access the mobile broadband card. A menu should appear asking you if you really want to establish the connection. This menu may look a little scary because it will say that you might periodically lose your Internet connectivity. Click the “Yes” button to approve the change to your computer’s settings. You now need to connect the mobile broadband card and your router. This is fairly simple, but you will need a Cat 5 cable to do it. Connect one end of the cable to the laptop or computer that has a mobile broadband card. You then need to connect the other end to the router’s LAN port. The router and broadband card should now be working together. If they don’t, then go back through these steps to ensure that you properly changed your computer’s settings. If it still doesn’t work, then consider calling your ISP or the broadband card provider to see if there is anything wrong with your connection. Connecting your mobile broadband card to a wireless router is fairly simple, and it should only take you a few minutes to change the appropriate settings. This will allow you to use your router and broadband card in tandem, and this can be a very powerful combination. Just follow these steps, and you should have no problems connecting your router and broadband card. Use highspeed-internet.com for wireless internet and other service options. Compare all plans on TV, phone and internet where you live.